A Pacific Northwest National Laboratory computation suggests that the water-gas compounds found in ocean permafrost can provide energy and store it, too – and then trap carbon dioxide. Hydrates are icy water-gas compounds abundant in ocean permafrost. They can hold numerous gases such as hydrogen, methane and nitrogen, a Pacific Northwest National Laboratory (PNNL) team’s supercomputer analysis of millions of molecular configurations reveals. Knowing the structure and molecular mechanisms of clathrates, the cage-like water molecules in compounds that host the gases, may help researchers find a feasible way to use hydrogen as an alternative fuel-storage system. What’s more, the study suggests a mechanism governing how gas molecules hop between adjacent cages. A possible application for exploiting this feature: extracting methane from the hydrates and replacing it with carbon dioxide in a Davy Jones’ locker scenario to remove and safely store the potent greenhouse gas. The study took more than six months on Hopper, the Cray supercomputer at DOE’s National Energy Research Scientific Computing Center (NERSC). Gas hydrates, long known to form at high pressures in deep ocean fossil fuel pipelines, were suspected as one culprit that complicated attempts to mend the Deepwater Horizon oil spill in 2010. At low pressure – Earth’s surface, say – methane hydrates are unstable and can be lit like an icy match, burning methane on the top as water drips at the bottom. Researchers and entrepreneurs have begun to notice hydrates’ potential environmental applications. Until Willow and Xantheas’ study, there had been scant information about how guest molecules like hydrogen interact inside clathrates’ hollow cages. Building on previous work, the team already had three-dimensional models of lattices made from cages of 20, 24 and 28 water molecules. The model used for the study was made with 20 and 24 molecules. X-ray crystallography spelled out the oxygen atoms’ positions, and the team’s previous work suggested efficient ways to place hydrogen atoms in the lattice. Imagine the clathrates’ cage of 20 water molecules as a soccer ball, Xantheas says. Because these are water molecules, 20 oxygen atoms on the surface means there must also be double that number – 40 – hydrogen atoms. “For the larger hollow cages comprised of 24 and 28 water molecules, there are millions of combinations you can do, and we figured out the most efficient ways and used numerous combinations in our simulations,” he says. 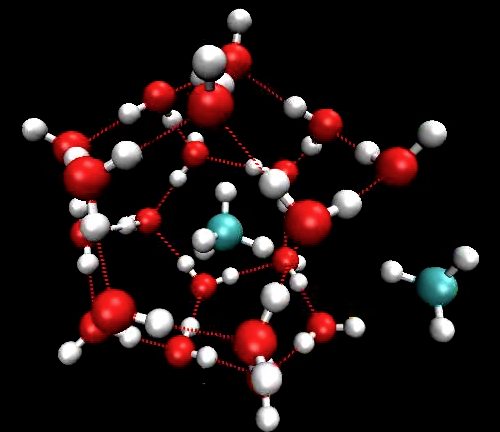 Animation: Catch methane in the act of escaping from a methane hydrate.